Old people can be so funny. Unabashed owners of their eccentricities and idiosyncrasies, they really seem to be on to something – enjoying life. Golden years, indeed. But eventually, it all becomes a bit less fun. The body, the mind, or maybe both, grow tired. Death becomes imminent. In these twilight years, folks need help. 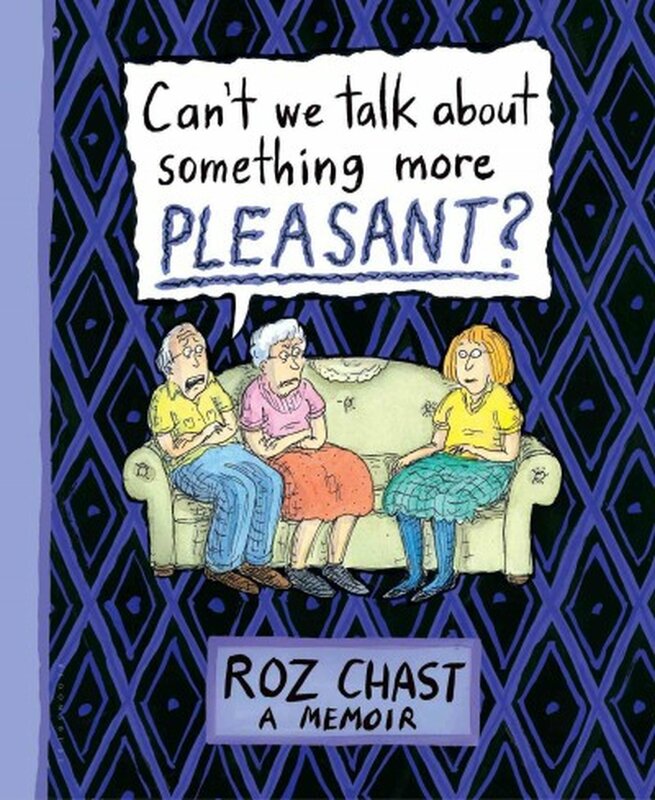 In her memoir, Can’t We Talk About Something More Pleasant?, New Yorker cartoonist Roz Chast chronicles her parents’ decline into poorer and poorer health. It begins with an inexplicable but intense impulse to check in on them. So Chast makes the trip from suburban Connecticut to her childhood home in Brooklyn. An ever-thickening layer of grime and a growing collection of junk mail indicate that things have changed. Her parents are no longer “TV commercial old”, spry and independent. They are scary old. And so it begins. Daily phone calls. Increasingly frequent visits. Cleaning ladies and Meals-On-Wheels. And then a move, to an assisted living community in Connecticut. Sorting through a lifetime of quirky and kooky collections – a drawer full of jar lids, stacks of empty egg cartons in the refrigerator – Chast recalls and recounts her formative years, delivering some hilariously deadpan anecdotes and memories. Laughter is the best medicine. And luckily, the Chasts’ big personalities provide plenty of fodder. But beyond the laughs, Can’t We Talk About Something More Pleasant? highlights some seriously sinister stuff. Yes, death is scary. Obviously. But not so much as growing old and dying in the economy it has become. The assisted living facility in which her parents spent their final years cost $8k per month, base. Hospice, $14k a month. While Chast doesn’t expound upon the unjust exploitation of the elderly and their fears, we readers cannot help but feel an indignant pang or two. Chast’s loose and spontaneous cartoons attest to the spirit of this story as she reckons with fear and guilt and helplessness, and then catharsis. Supplemental photos provide some very funny testaments to the zaniness she describes. As she reconnects with her parents, we, too, grow to love them. An excellent tribute. And a lovely way of saying goodbye.